You can find answers to common issues below. If you have any additional questions don't hesitate to contact us. If you are experiencing issues with your Internet, here are some things to try that resolve most issues. Disconnect the power from the router and wait 30 seconds before reconnecting. Make sure phone line from router is firmly plugged into a phone jack and router. Make sure that there is a filter on all devices plugged into phone jacks including: phones, answering machines, fax machines, satellites, etc. except modem/router. If using a splitter/filter be sure that cord from router is plugged into the DSL side of the splitter. Try bypassing the splitter and plugging the line from the router directly into the phone jack. If on fiber optics or using a separate modem, try bypassing the router and plugging computer directly to ethernet cable. For wireless information including SSID (Wireless connection name) and security key or passphrase look at the bottom of the router. There is usually a sticker that contains that information as well as the public ip, the router’s ip and log in information. Be sure to have the PC connected directly to the router/modem with an ethernet cable and disconnect all other devices before running the test. Do Not Press the Reset Button on the back of the router. (Paperclip in reset hole). If you have pressed the reset button on the router contact tech support to help reprogram the router. Do I need a Phone Line to get Internet? Yes, at this time a Phone Line is required when signing up for Internet. Keeping the wireless network in your home secure is also important. Consider these tips from OnguardOnline.gov, a website maintained by the Federal Trade Commission (FTC), to keep your home network secure. Keep your anti-virus and anti-spyware software up-to-date and use a firewall. Turn off your wireless network if you know you won’t be using it for a period of time. Use encryption. Most wireless routers come with an encryption feature which you may have to turn on. The two main types of encryption available are Wired Equivalent Privacy (WEP) and Wi-Fi Protected Access (WPA). WPA, especially WPA2 , is stronger than WEP. The computer, router and other equipment connected to your network must use the same encryption. Triangle Communications adds encryption by default to your router. Please contact technical support at 1-877-730-8215 if you would like to change your wireless security code. This last tip is extremely important. If you do not use your wireless router’s encryption feature, you will most likely end up sharing your Broadband service with other computers and devices in the area. Not only will this frustrate you since your connection will be slowed, but you could be held responsible if illegal activities including music or video copyright infringement or objectionable content transmission are undertaken with your connection. These illegal activities can result in termination of your Internet service and in some cases, significant fines and legal consequences. Instructions on changing your security code (or key) vary depending on your wireless router brand and model. If you purchased your router from Triangle Communications, our 24x7 free technical support personnel will assist you in changing your security code. Using public WiFi hotspots to access websites just for viewing is generally safe as are password-protected spots. Here are a few things to consider for keeping your information safe while using public WiFi hotspots. Use a firewall. A firewall is a software program or hardware that helps prevent hackers, viruses, etc. from reaching your computer. Don’t assume that a WiFi hotspot is secure. Try to avoid accessing sites that require you to type in an account password or credit card number. This could include banking, social media or e-mail accounts. Hide your files that contain personal or financial information. Some operating systems include tools to convert your files into a format that can’t be read by others. If you are experiencing issues with your Phone, here are some things to try that resolve most issues. Unplug all telephones and accessories (answering machines, faxes, modems, computers, security systems, satellite dishes, etc.). Leave everything unplugged for at least 5 minutes. Try plugging in a corded phone and see if you have dial tone. If you do, plug in each piece of equipment one at a time to see which one is causing the trouble. If all phone equipment is still not working, go outside to your network interface device (NID) and test a corded phone in the inside test jack to determine if the problem is with your equipment, inside wiring or Triangle's wiring. The NID is located where the phone lines enter your building. Noise on a Cordless Phone- Several factors, not associated with the phone line itself, may cause noise on cordless phones. Noise can be caused by weather, fluorescent lights, CB radios, AM/FM radio stations and other temporary conditions. Please contact the cordless phone manufacturer for assistance. Oftentimes, the solution can be as simple as replacing your cordless phone's handset battery. Always keep a corded phone on hand for testing and use during power outages. To change your Email password follow the instructions here. You will need your username and password. Make sure to include @itstriangle.com. Log into your Triangle Webmail to be able to view your messages in webmail also. For the spam filter side of things, on the main screen click on “Spam Center”. This will log you into the spam filter. This web based interface gives you more spam filter options than the e-mail interface does. 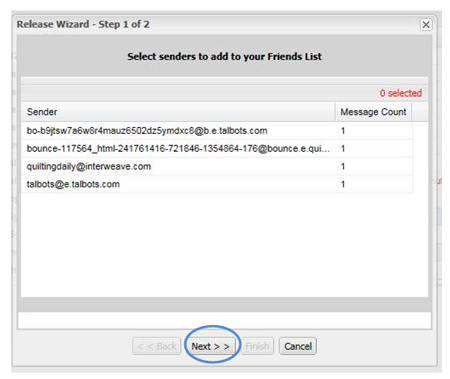 If you see multiple messages that you want to receive, hold the control key down while you click on each message. Once you have selected all that you want to receive, click on “Release”. A pop up window will appear. Check the box next to "Modify my friends, enemies or other filter settings." Click Ok.
Click “Next” to whitelist or blacklist all of these. Change the option to "Allow" and click "Finish." Do I have to use your email? No, you are free to use email from any provider, such as Google or Yahoo, that you prefer. If you didn't find an answer to your question, feel free to contact us.